Our good friends and neighbors Kevin & Michelle Mannella, own and operate a Bed & Breakfast - "Hayward House Bed & Breakfast." One of the coolest things they have is an "autograph wall." 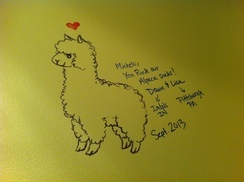 It's hidden away in a small room where guests can get coffee and tea - to our delight the photo was drawn on their wall. 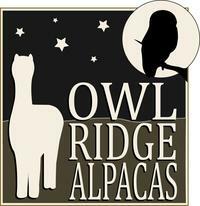 We often get guests coming over four tours and to see what an Alpaca really is. Cameron had given a tour the day before - and the guests loved it. By the looks of it - they loved their stay at the B&B as well - and who wouldn't...check it out at www.thehaywardhouse.com. You won't go wrong - and with an innkeeper being a licensed massage therapist - you'll leave more relaxed than when you first arrived.